A group of Syncrude employees joined Diane, Leslyn, Muna and I for a United Way "Seeing is Believing" tour on Friday. I had been on one of these when I was a member of regional council last year and found it to be incredibly informative, insightful and at times, emotional. I remember saying after that first tour that this should be a mandatory activity for senior leadership, elected officials, and anyone who makes major decisions that affect our community. We visited Stepping Stones (youth shelter), the Boys and Girls Club, and the Centre of Hope. This time our larger group split into two and we went our separate ways on a walking tour of three United Way funded agencies in the downtown core: The HUB Family Resource Centre, Some Other Solutions and the Salvation Army. The revelations, discoveries and Aha! moments were many, the impact, profound. "I've lived here 35 years and I had no idea," said Syncrude Campaign co-chair Dave Evoy. He was reacting to our 45-minute walk through the Salvation Army location on MacDonald Avenue. "I only thought it was the Thrift Store and that was it." He was not alone in having made that assumption. On the second level and down in the basement, the Salvation Army is so much more. A dry shelter for 32 men with a soup kitchen, it is a place for fellows who have nowhere else to go, but are ready and able to get to work. In some cases, they have arrived here from other countries and just need a bridge, a hand up. The shelter is "dry", in the sense that there is no alcohol allowed, and you are not allowed to be under the influence when entering. "Guys who stay in the shelter become like family, to us and to each other," said Joan Nobles who was leading the tour. They live in close quarters, clusters of 8 beds, larger bunk-style units, with a shared bathroom. They also get the use of a locked storage locker. "The lockers are very important," said Joan. "It means they don't have to haul their luggage to job interviews." The sound of the refrigerator units hums in the background as we stand in one of the shelter units. They're hoping to make some changes to the whole kitchen area to make it more functional, but as with all things in the social profit sector, it always comes down to money, or gift-in-kind donations that help turn dreams into the reality. We didn't spend a lot of time in the Thrift Store, quickly passing through the retail section buzzing with people, into the sorting area in the back. Black, orange and clear plastic garbage bags are piled high, waiting to be culled and organized. "This is nothing," said one of the employees. "By Monday, this whole wall will be stacked high." Space is a major issue. 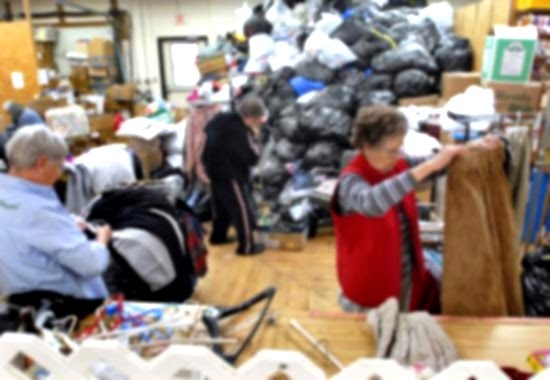 Finding room to store unsorted donations is one thing, but they also have to keep enough real estate to do the sorting. People work in close quarters behind the swinging door that leads out to the sales area. "Are there things you don't take?" asked one of the Syncrude folks on the tour. "Old TVs and mattresses," she said. Off in the corner was a box of examples of other examples of things they frown upon: a battered cookie sheet, a mud encrusted pair of hiking boots and a filthy old coffee maker. "If it's something you wouldn't realistically have in your own home, it's best not to pass it along to us." Down in the basement, piles of boxes fill the space, pre-sorted and ready for alternate seasons. "There is no reason that anyone should go without," said Joan. "If someone has absolutely no money and needs clothing, we're going to help them." 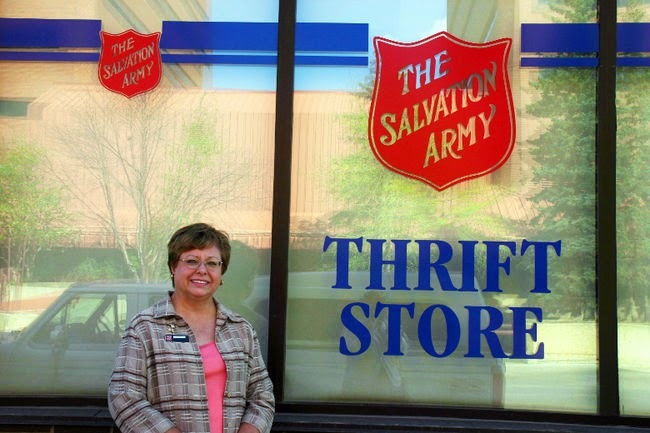 The Salvation Army also has a role to play in emergency response, keeping a supply of new clothing in a special area for those occasions when there has been a major loss of a house, apartment or condominium. The Mat Program space is currently under renovation. A former client is volunteering his time doing drywalling and making off-season improvements to the space, also thanks to a donation of paint from Rona. Funded to run 8 months a year, the Mat Program will kick-in again by mid-September when the weather starts turning cold. This room, located at the bottom of a steep set of stairs, is a daily life saver when winter really sets in. A small partitioned area is available for females with the bulk of the space for the predominant male clientele who rely on the program. When it is back up and running, there is a food service area, a kitchen, washrooms, and showers. 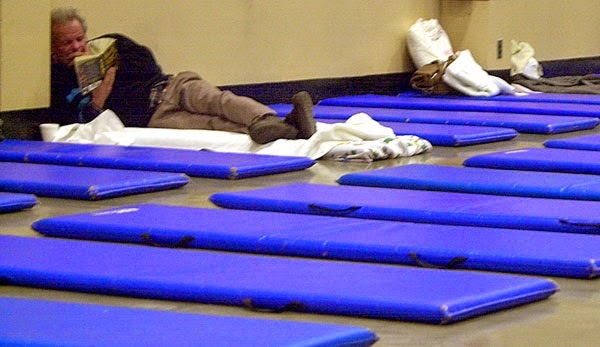 The patrons sleep on gym mats (similar to the picture above) with a pillow-like mat that is easy to clean. I didn't write down the total number of mats, but 34 is the number that pops into my mind. They will stretch that number when it's really cold, allowing late-arriving patrons to crash sitting up at one of the tables. "Ideally, it would be much better to have all these services on one level," said Joan. "As the only wet shelter in town, it is incredibly dangerous for someone under the influence to come down those stairs." Of the entire group of 16 or so people, only a few had any knowledge of the breadth of what really goes on at the Salvation Army. It shocked most of us to find out that inclusive of the folks that work with the START program, over 100 people are employed with this essential social profit organization. "We need to do a better job of telling our story," said Joan Nobles as we were getting ready to climb the drywall-dusted stairs to return to street level. "That's where you come in," chimed in one of the Syncrude team members, looking over at me, smiling. There are stories to tell, no question. 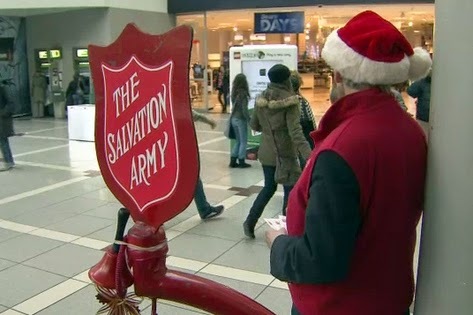 If 90 percent of us knew almost nothing about the great work of the Salvation Army, it stands to reason that a similar number would exist in the broader community. Imagine the increase in support if we were successful in raising awareness, even by as little as 10 percent. Seeing IS believing. "You're welcome to come and visit us anytime, especially during program hours," said Joan. It begs the question for all of us: What do we see each day, but don't really see at all? I've lived in Fort McMurray for 18 years, and served in a number of community leadership roles, yet yesterday was my first meaningful exposure to what the Salvation Army has done for each of the 6,570+ days that I've lived in the community. I'm a bit embarrassed to be completely honest. 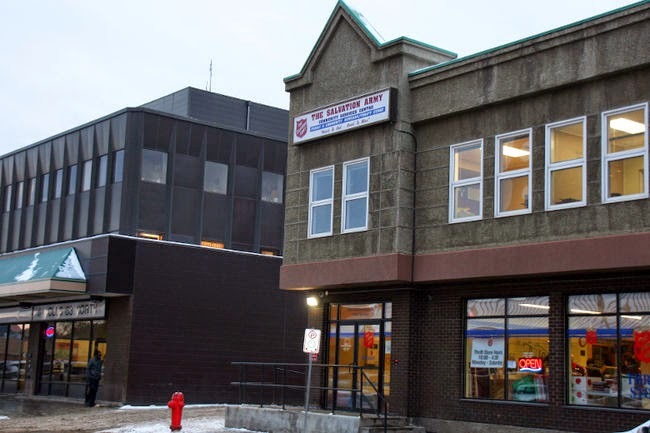 I've only written about the Salvation Army, but I'm equally grateful to The HUB Family Resource Centre and Some Other Solutions for opening their doors for us on the Seeing is Believing tour. I'm also grateful to the Syncrude team for their willingness to learn more about three of our United Way funded agencies. "Fundraising is important," said Mark Ward, CEO, Syncrude Canada Ltd., "but what the money is used for is even more important."